Do you know if your gas cylinder has been safely and legally filled? 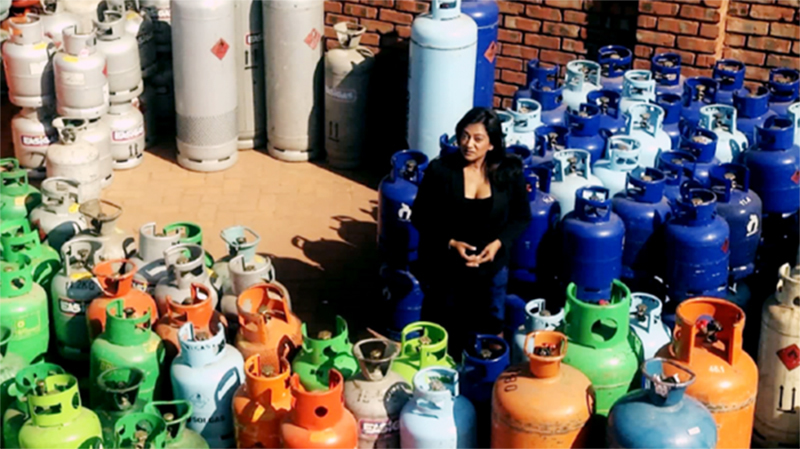 Devi Sankaree Govender talks a bit about what we uncovered as we looked into the gas filling situation. Don’t miss this Sunday’s upcoming Gas Catastrophe story. What were you looking forward to most on this shoot? I often buy gas for heating purposes at home and I had no idea that some places were selling gas cylinders that had been illegally refilled. In my head, gas was gas, right? Wrong! According to the law, you’re only allowed to refill a gas cylinder if that cylinder belongs to you – so only Easigas is allowed to refill Easigas cylinders. This ensures that the cylinders are properly maintained – nobody wants their gas heater to blow up. We’d got wind of a few illegal operations that were not sticking to the law and I was really looking forward to busting them. As with any confrontation or bust, there is always the concern of catching a ‘klap’. The highlight was having Johannesburg’s Emergency Services closing down an illegal operation after they accompanied us on one of the busts – the owner disappeared, but will have to do some serious explaining. I was really taken off-guard after discovering so many garage forecourts selling gas – illegally filled – to unsuspecting consumers. This is just not on! Watch the story when it airs this Sunday – 27 July at 7pm. Previous Devi Sankaree Govender interviews Judge Chris N Greenland on the Oscar Pistorius Trial of the Century – 8th April 2014	Next Too Old To Drive?